When it comes to selecting the right equipment for your warehouse, business, or any other type of facility, hand trucks should be at the top of the list. Hand trucks are an amazingly versatile resource: you can find them on loading docks, in airports, storage facilities, grocery stores, you name it! Because hand trucks provide a necessary function to your business, you should only invest in ones that are top quality. Luckily, S.W. Betz is here to help you find exactly that. S.W. Betz is a stocking distributor for one of the top manufacturers in the hand truck industry: Magliner. 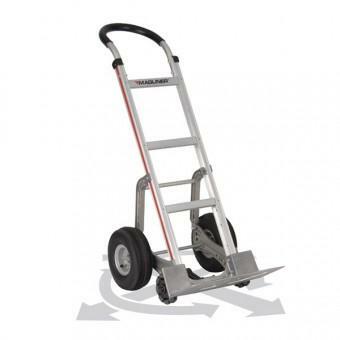 Magliner aluminum hand trucks are the lightest in the industry. Since we are a stocking distributor, we have a large inventory and, in most cases, can get you your hand truck order filled right away. In addition to aluminum hand trucks, S. W. Betz also provides steel hand trucks. Why Do I Need Hand Trucks? Hand trucks are carts that can be operated either in an upright position or, with certain models, in a horizontal position in order to ensure maximum ease when transporting different items within your facility. Their function is an invaluable one, as it prevents your employees from having to lift and transport heavy items on their own, which can put them at risk of fatigue and/or injury. Not only could they be injured, but moving items one by one is incredibly inefficient. In order to reduce liability and increase efficiency when moving items, hand trucks are your best bet. How do Hand Trucks Become Damaged? While the durable models sold by S.W. Betz have the capacity to hold up under heavy weights and to withstand a lot of wear and tear, hand trucks can sometimes become damaged. This can happen when the hand truck is dropped or is mishandled in some other way. Whether the fix is a simple tire repair or a slightly more involved issue, our team of experts can quickly and efficiently repair the damages and get your hand trucks up and running again. One way to ensure that your hand trucks function properly is by following the correct safety protocols for their use. One thing that you should absolutely remember? When loading items on to your hand truck, start with the largest/heaviest items first and place them at the base. Lighter items can then be stacked on top while still retaining the hand truck’s balance. This entry was posted on Wednesday, November 26th, 2014 at 5:08 pm. Both comments and pings are currently closed.